Bake the cupcakes according to the packaging and leave to cool completely. For the frosting, using a mixer (use the paddle attachment if you own one), cream the butter until light and fluffy (about 3 minutes). Slowly add the sugar, scraping down the sides of the bowl, a little at a time. After all of the sugar is added, add the vanilla and continue beating until the icing is smooth and light (icing may appear dry). Add 2 tbsp of milk, for moisture, and beat for 1 additional minute. Once the cupcakes are cooled, cut out a small circular cone from one cupcake at a time. Fill half of the cupcakes with a small ball of cookie dough and the other half with 1 or 2 frozen raspberries and ¼ tbsp strawberry syrup. Tear off the tip of the cupcake cone and place tops back on each cupcake. Next, frost each cupcake, making sure to cover the knife marks. 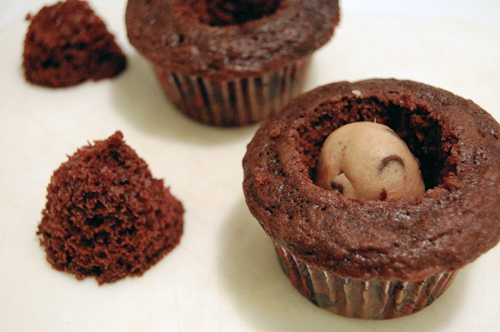 Decorate the cookie dough cupcakes with mini chocolate chips and another cookie dough ball. Decorate the raspberry cupcakes with 3 raspberries each and red sprinkles. There’s two words that made me read your post: stuffed and frosting. Cake and cookie, too. Fun! I love the idea of dressing up boxed cupcake mix! Sometimes I just don’t have the time to drag out all the ingredients so this is perfect! Stuffed cupcakes, what could be better? These look delicious! These are so cute, and I loved stuffed cupcakes. Will give them a try! This looks so good. I recently had one that was banana cupcake with a reese’s cup. I could have eaten a dozen. My son would just love the cookie dough cupcakes; I already love the raspberry (by pictures alone). I LOVE IT!!! That is such a great idea, they would be a huge hit with my family! Oh my, this would gladly slip me into a cookie coma. These cupcakes look amazing! Love that they’re stuffed too! great idea and amazing flavor combos! but i have a question… is there some trick to making boxed cupcakes? i can make cakes, bread, pasta etc all from scratch, but the moment i try and use a boxed mix to save time EVERYTHING goes wrong. the cupcakes fall, some are burned while some are raw in the middle, i get weird air bubbles, the liners get uber greasy.. its supposed to be easy right? you made them look so gorgeous! Yum that sounds so good! Hey! Just wanted to let you know I’m passing on a couple blog awards to you! Just go to my site to claim them and then pass them on to other worthy bloggers! Cupcakes filled with cookie dough? Sign me up! These must have been amazing tasting! Fabulous cupcakes. They looking charming and the cookie dough centers are a wonderful surprise. I’ve always tried to stuff the cupcakes before I bake them and they consistently turn out uncooked. So brilliant to just stuff them afterward! Cookie dough inside a cupcake?! Wow! I am going to have to try this! Thanks!